The latest herbal textbook for professional herbalists. 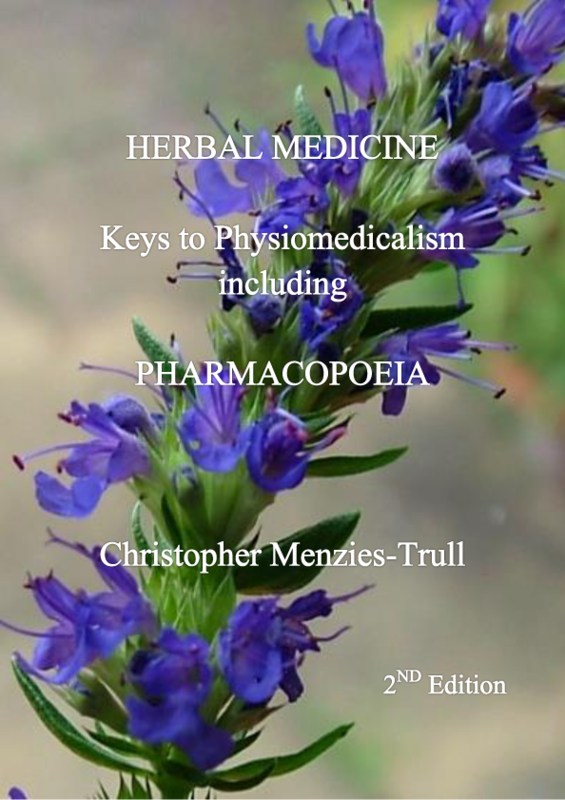 'Herbal Medicine Keys to Physiomedicalism including Pharmacopoeia'. 682 pages. Packed with research and detailed information on herbal medicines. Easy to access detailed Pharmacopoeia of information on 413 Herbal Medicines. 41 Chapters with clear descriptions including: Aetiology, Herbal Pharmacy, Typology, How to get the patient better, Emergency Herbal Medicine, Cardiology, Dermatology, Physiomedicalism, Tropical disease, Gastro-enterology, Gynaecology, Herbal research, Potent oncology, Neurology, Vital Force, Rheumatology, Pathology, Urology, Prognosis, Geriatrics, Endocrinology, Paediatrics, Nutrition - vitamin, mineral and trace element doses and usage, Food regime and nutrition advice and Flower remedy indications. Chapters link the herbal approach to herbal and Naturopathic treatment. PharmacopoeiaÃ¢â?¬â?¢ is the experience of my 34 years in Herbal Practice. â?	Emergency Herbal Medicine and Pyrexia. â? The herbal pharmacy and herbal pharmacology sections of this book are comprehensive, meticulous, and well-referenced. Not only are methods of extraction and formulation carefully explained, but the reasons behind certain processes are also given, together with examples, helping the reader to develop their own expertise based on sound knowledge and understanding. So this is a textbook, a reference book, and a practical manual - all in one volume. Prof Elizabeth M Williamson, Editor, Phytotherapy Research. The School of Pharmacy, University of Reading. A treasury of thoroughly researched information from an author with a wealth of practical experience as a Medical Herbalist and Naturopath. The Neurology chapter is of value for practitioners working with clients who have mental or emotional distress. Christopher Menzies-Trull succinct and highly readable style engages the reader and makes this compendium very difficult to put down. It was with great pleasure that I was asked to review Chris Menzies-Trull's book on herbal medicine as I know of him by reputation as an eminent herbalist and naturopath. The book did not disappoint. This is a very clear and comprehensive account of natural healing, it's principles and practice, through naturopathy and herbal medicine. Such texts are much needed in these times as ill-health and disease become more common and deep seated. The book is suffused with the energetic principles which underpin natural medicine - an essential resource for practitioners. Christopher Menzies-Trull BA [Hons], MFPHM, ND, MRN is a leading medical herbalist with over 32 years of experience treating clinical conditions with success. He has diplomas in Herbalism, Naturopathy and Iridology. He has considerable research experience. Available. Ordered per shipment, check on current stocks.